The Cuisinart CSG-466 is a digital folding probe thermometer that is simple and effective way to check in on the readiness of grilled meats. 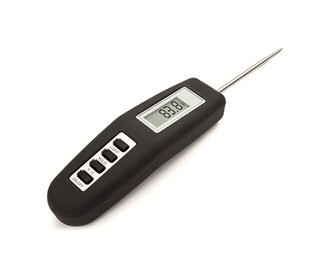 This thermometer has a digital LCD display that reads internal meat temperatures instantly. The probe is long enough to fit in any sized meat cut and folds into base for convenient storage. Built-in LED light allows for grilling at night. Comfortable grip and the folding probe provide perfect angles and comfort when reading temperatures in hard to reach places. 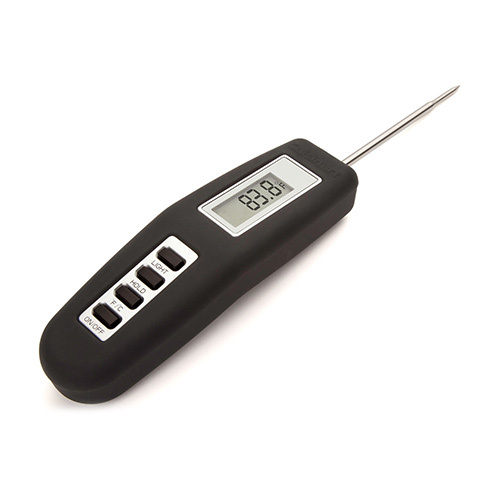 The Cuisinart Folding Probe Digital Thermometer has many exciting features for users of all types. You can extend the lifetime of your Cuisinart Folding Probe Digital Thermometer with the purchase of a FactoryOutletStore Factory Protection Plan. See the Cuisinart Folding Probe Digital Thermometer gallery images above for more product views. The Cuisinart Folding Probe Digital Thermometer is sold as a Brand New Unopened Item.